Yellow helmets are presented after completion of mandatory Firefighter I training. Probationary firefighters are issued a black helmet which signifies non-interior qualification. Upon completion of Firefighter I, they receive their yellow helmet, which designates an interior firefighter. Firefighter I training involves several months of classroom and hands on training. This is the first major accomplishment of a new firefighter. 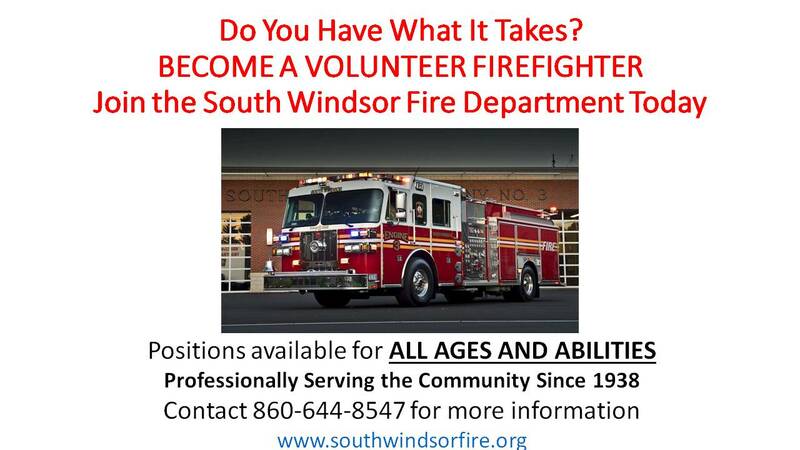 Do you have what it takes to become a member of the South Windsor Volunteer Fire Department? The SWFD is currently recruiting new members. What does it take? We are seeking new members of all ages and abilities who possess a desire to help and a passion for service, as well as a sense of pride and tradition. Founded in 1938, the South Windsor Fire Department has been an all-volunteer service for over 75 years; but we can’t do it without your help!! Come join our team of highly dedicated and well trained members who have the newest apparatus and state of the art equipment at their disposal. Positions include Fire Fighter, Fire Police, Fire Explorer (for youth aged 14-17), Support Staff and Fire and Life Safety. All training and equipment is included. For more information, please visit www.southwindsorfire.org. Please. Do NOT put ashes in regular trash. Keep in closed metal container AWAY from home / sheds. YOU could be a South Windsor Volunteer FIREFIGHTER! Join us today! NEED 9-1-1? CALL IF YOU CAN. TEXT IF YOU CAN’T. 12/29 - See the FireRescue1 news feed on the Links page! See SWFD Service Call Statistics! See the history of SWFD with the new SWFD Timeline!